The Arrivals is a relatively new (2014/15) NYC-based brand that is not only delivering a fresh take on outerwear, but also on ecommerce marketing. In the above welcome email, the brand combines the gif format with evocative copy to create two unmissable CTAs: 'Explore our story' (shown above) and 'Spread the love'. Verbs like ‘explore’ and ‘spread’ are more dynamic and interesting than those us marketers tend to use (e.g. 'learn more' or 'sign up'), creating a sense of movement and energy which is backed up by the flashing arrows adjacent to them. Similar to other young pure play brands like HOT!MESS, ASOS and Nasty Gal, Missguided has nailed the art of appealing to its target audience of teenagers and twenty/thirty-somethings through its vernacular, on-point copy. The words ‘join’ and (now pretty trendy) ‘squad’ are likely to make a reader feel like they’re being invited to become part of something exclusive, rather than just signing up for a newsletter and discount. From Missguided’s on fleek* lingo, we move onto to this brand's more wholesome lexicon. Offering the latest ‘European trends and vintage couture clothing for children of ages newborn to 12 years old’, Itty Bitty Toes opts for a playful, fun CTA (‘Spin!’) that compliments its ‘spin the wheel for a chance to win’ sign up competition. The alternative ‘No, I don’t feel lucky!’ is notably not given a different colour background, making it less clickable than ‘Spin!’. We’ve written about & Other Stories’ amazing storytelling skills in the past, and its CTAs are no exception. The secret? The Swedish retailer tends to theme the wording of each call-to-action around the topic of the rest of the email. So in the above example, ‘Take the plunge’ is a play-on-words alluding to both jumping into a swimming pool (pictured) and deciding to purchase something from its swimwear collection. In terms of presentation, the call-to-action is capitalised, given a line all on its own and underlined for extra effect. As you can see, & Other Stories makes all of its CTAs *part of* a campaign; instead of coming across like a last-minute add-on, they are used as a way to enhance meaning— bringing all of the content together in an email in one short, snappy sentence. 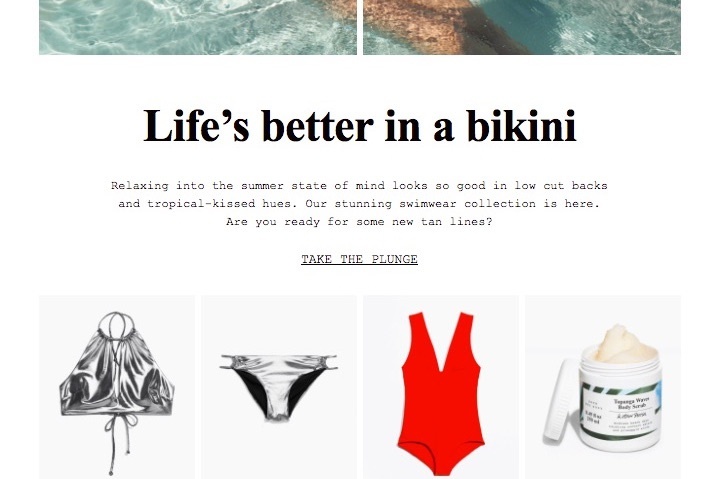 One of our favourite (ecommerce) wordsmiths today, AYR is a brand that knows how to create the perfect CTA. As shown above, the first CTA is spotted in the email’s subject line with ‘Don’t miss out’, followed by the preview text ‘[open]’. Simple but sharp. Once a subscriber does as they are told and opens the email, they are met with the one word CTA: ‘Mine’. This is pretty abstract, so why does it work? 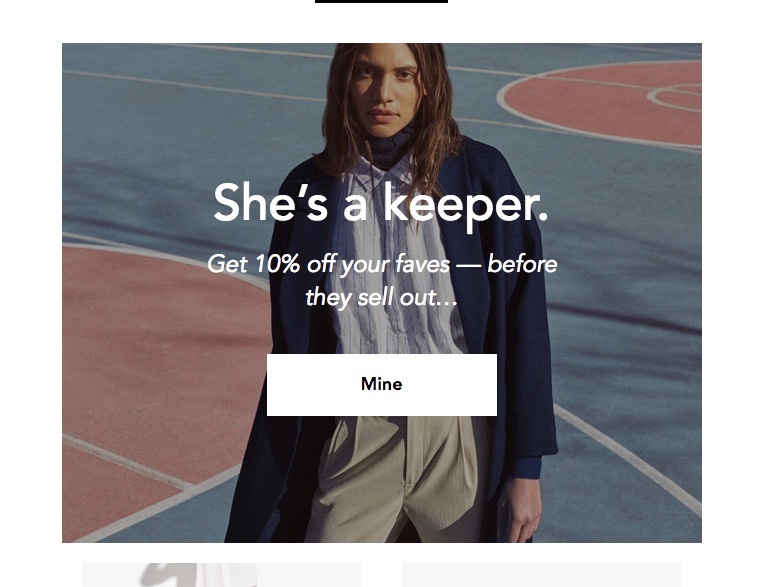 AYR cleverly taps into the thought process consumers have when they see an offer they want: ‘I want to make that discount mine’. Similar to Missguided, the brand uses colloquial copy for its CTAs (as well as the surrounding copy) to show a consumer they’re on the same page. Ever since it was founded by Emily Weiss in 2014, beauty brand Glossier has been making (marketing) waves across the industry. From its profound premise (to celebrate real girls, in real life) to its ultra cool website, this is a brand that knows how it’s done. Born out of the successful blog Into the Gloss, it’s no surprise that Glossier’s CTAs have an editorial edge. 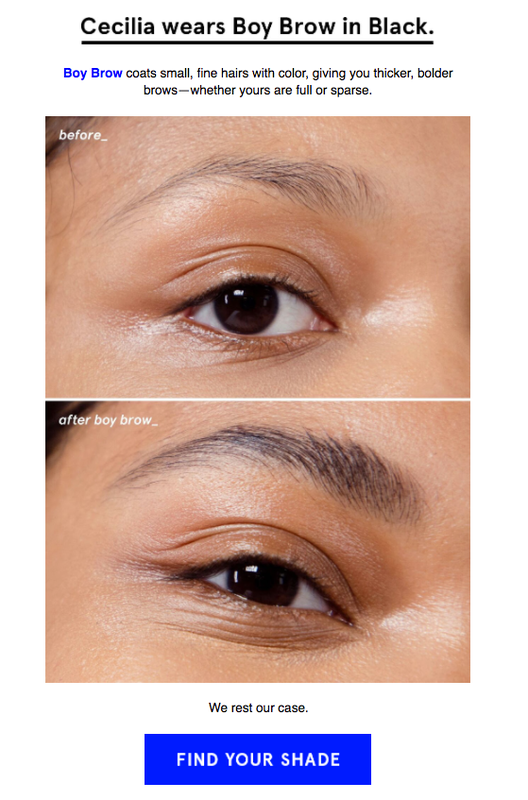 In the example above, the brand shows recipients how a product works before inviting them to ‘find’ their own shade. By appealing to a reader directly (‘your’), Glossier cleverly shifts the focus from the model (Cecilia) to the consumer. As someone subscribing to Glossier is likely to be interested in how its products can benefit them, this is likely to appeal to its target audience. With a royal blue background, the CTA really pops in contrast to the rest of the email copy, making it much more clickable. As the majority of ecommerce marketers will know, it pays to create a sense of urgency when promoting a product, sale or competition. 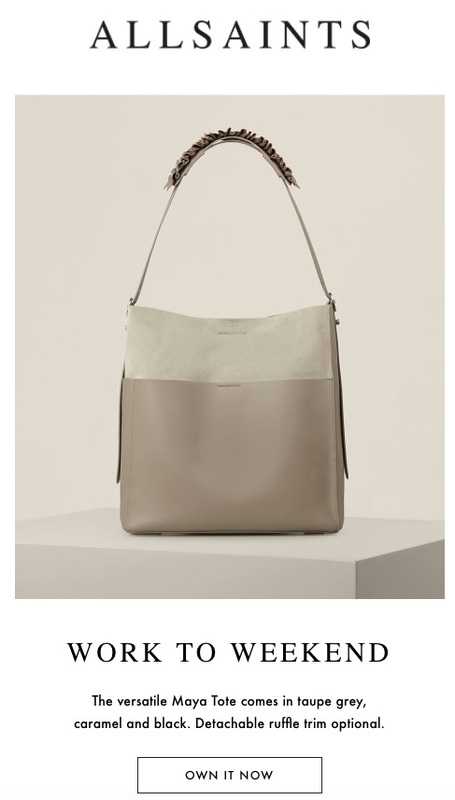 Our ecommerce crush of the moment, Ann Taylor, puts this knowledge to excellent use in the above email promoting a soon-to-end sale. By using the gif format, the brand manages to create the illusion of a clock ticking rapidly. This sense of movement is complimented by the subheading ‘Time’s Flying’ - both of which serve to reinforce the message of the CTA—that recipients need to ‘most fast’. We know we only promised you seven examples, but once we'd hit 'publish' on this post we came across the above popup on the urban garden ecommerce site Patch. 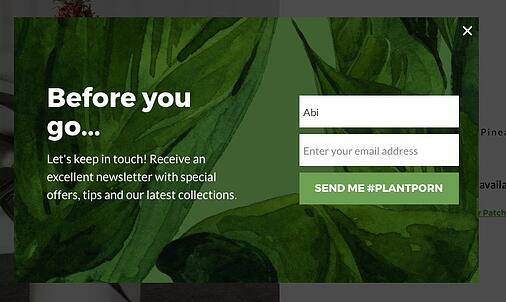 Using an alliterative hashtag, the CTA ('Send me #PlantPorn') tells website browsers what they can expect to receive if they sign up in a lighthearted and comical way. When it comes down to it, the copy, design and positioning of your CTA will all depend on your brand’s personality and target audience; after all, what will spur a Missguided consumer to click is unlikely to impress an Itty Bitty Toes shopper. That said, what is true for all brands, regardless of how different they are, is the notion that it pays to invest time and energy in crafting an irresistible CTA. To find out what works best for you, we recommend A/B testing your CTAs. This enables you to not only learn more about your target audience and what appeals most to them, but also continuously optimise the performance of your campaigns. To learn more about A/B testing (including success metrics you can use to glean results), you can find our blog post and a link to our ebook on the subject here.